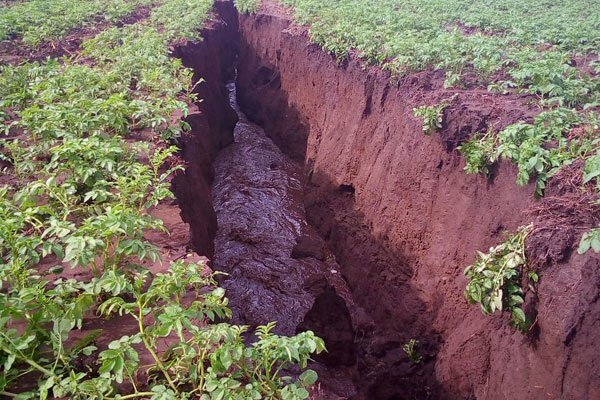 A month after a huge crack was reported in Kenya’s Rift Valley, another two-kilometre fault line has cracked open on Monday on the outskirts of Naivasha town in Nakuru County where farms have been swallowed. 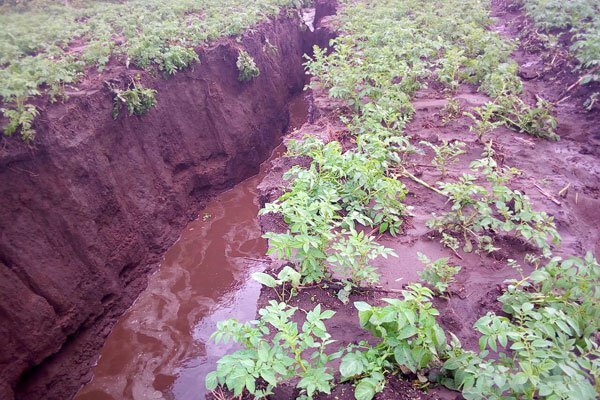 At least 16 families have moved to safe grounds as several acres of crops were destroyed by the crack that was filled with water believed to be from rains in other parts of the country. 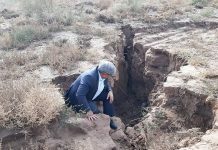 “The heavy rains pounding this region have contributed in a way to the fissure … It’s a 20-foot deep crack that runs across several agricultural farms. 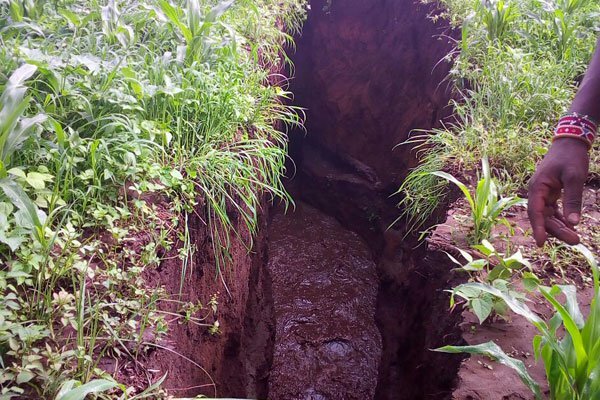 The families were asked to leave primarily for their safety,” said Naivasha assistant county commissioner Joseph Opondo on Tuesday. 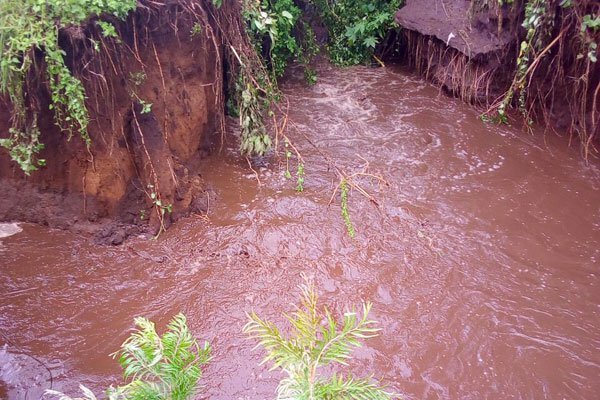 He added that a team of engineers and experts are assessing the situation as roads and a major river have also been affected. 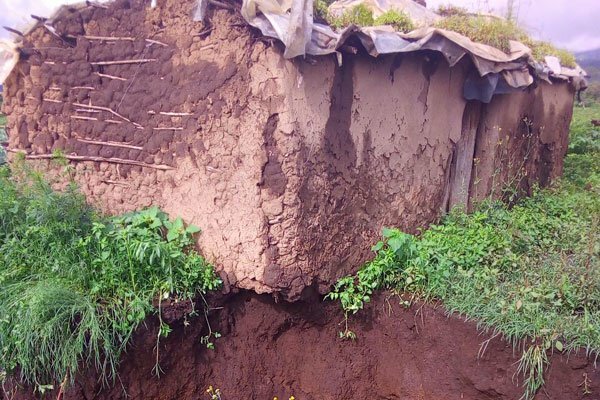 The cracks started opening up last month in Kenya with a huge earth crater in Narok County believed to have been caused by heavy rains and seismic activities. You remember? Geologists say in about 50 million years, the African continent will split into two with the Somali tectonic plate which covers the Great Rift Valley – running from the Horn of Africa to Mozambique – separating itself from the Nubian Plate (African Plate). 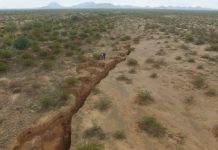 Kenyan geologist David Ahede told local media that he believes the origin of the movements is a shield volcano called Suswa that lies at the base of the Great Rift Valley with a history of tectonic and volcanic activity. He added that the earth movements have resulted in weaknesses and the weak zones form fault lines and fissures which are normally filled by volcanic ash, most likely from the nearby Mt Longonot. OMG! The African continent is really going to split it two! Yeah, 50 millions of years!!!!!!!………. Is Africa breaking or stretching? Well the ground isn’t stretching, but ripping apart and causing huge holes. Obviously, it’s not stretching, so it must be breaking. That is your logic 101 class for the day, thanks for tuning in. 100 years from now they will tell us that water made the crack in the earth through millions of years of erosion.